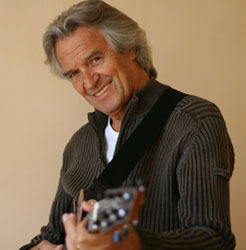 One of the most versatile and influential guitarists of our time, John McLaughlin is known as an extraordinary solo artist, as the leader of both the group breaking Mahavishnu Orchestra and the revolutionary indo-jazz group Shakti and as the composer of some of the most stunning classical Jazz-fusion pieces ever written. He is one of only a few white musicians to play with Miles Davies and he played with Jack Bruce pre Cream. John was born in Doncaster to a family of musicians (his mother was a concert violinist), and he studied violin and piano, taking up the guitar at the age of 11. He lived in Kirk Sandall until moving to London in the Sixties. Find more out about John at John McLaughlin's Web Site. Thanks to Richard Beresford for his help with John's profile.